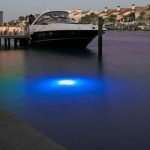 Apollo 40 IRIS two color underwater LED dock lights are the future of underwater lighting. With the Apolo IRIS you get two beautiful light colors in one light. 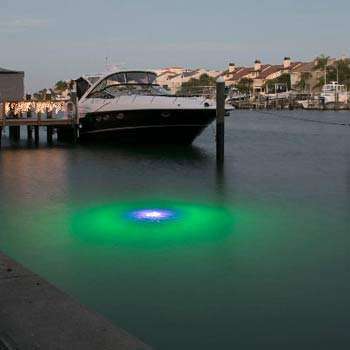 The main “outer” color creates a beautiful ball of light in the water up to 40 feet across. The inner “IRIS” color shines up through the middle of the light ball like the IRIS of an eye. They combine exceptional design, superb craftsmanship and technologically advanced electronics to create the worlds finest dock light. 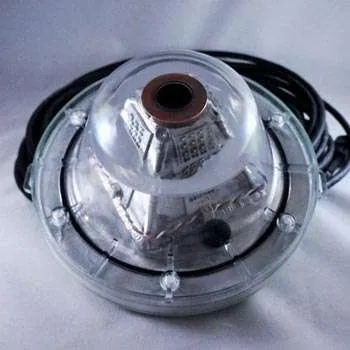 A patent pending internal water cooling system, advanced circuitry and super bright LEDs make this the brightest, most energy efficient fishing light in it’s class. Being LEDs, these lights have no bulbs or ballast to replace, ever! In fact, with a 100,000 hour life expectancy you can run these lights 8 hours a night, 7 days a week for over 30 years before they need to be replaced. The super efficient LEDs use only 40 watts of power adding only $1.15 a month to your electric bill. (Based on 240 hours a month, $0.12/kwh) Best of all, this is a plug-and-play system. Simply place your light in the water at your desired depth, plug the cord into a GFCI outlet and enjoy! 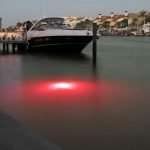 In clear water, the Apollo 40 IRIS will produce a two-color pool of light up to 40′ in diameter. 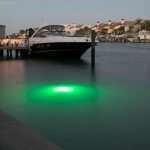 The light pool beautifies your waterfront while it attracts fish from far away. 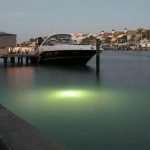 Your family, friends, and neighbors will be amazed at how beautiful your dock looks and at how many fish the light attracts.